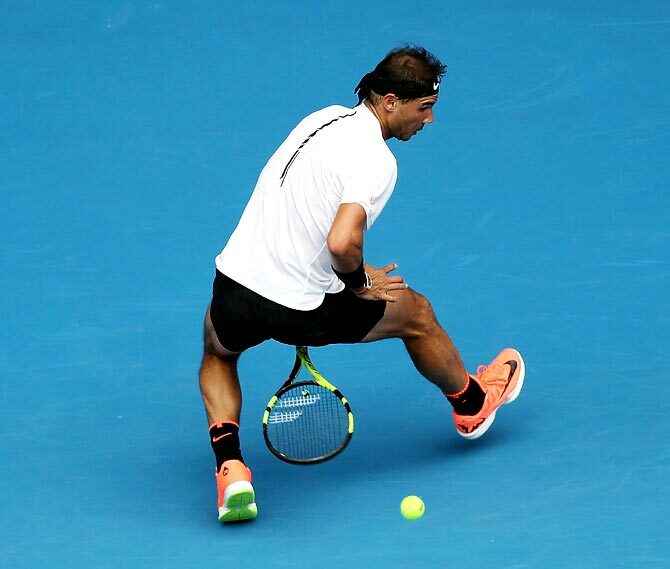 Rafael Nadal easily avoided the embarrassment of a back-to-back first round exits at the Australian Open on Tuesday, ramping up his serve and rattling off 39 winners to beat Florian Mayer 6-3, 6-4, 6-1 on Rod Laver Arena. The 2009 champion, seeded ninth after a disappointing injury-disrupted 2016 season, grasped his chances ruthlessly to overcome the German in a little over two hours in the brutal afternoon heat at Melbourne Park. The 14-times Grand Slam champion, who was watched by new coach Carlos Moya, moves on to a second round clash with Cyprus's former Melbourne Park finalist Marcos Baghdatis. 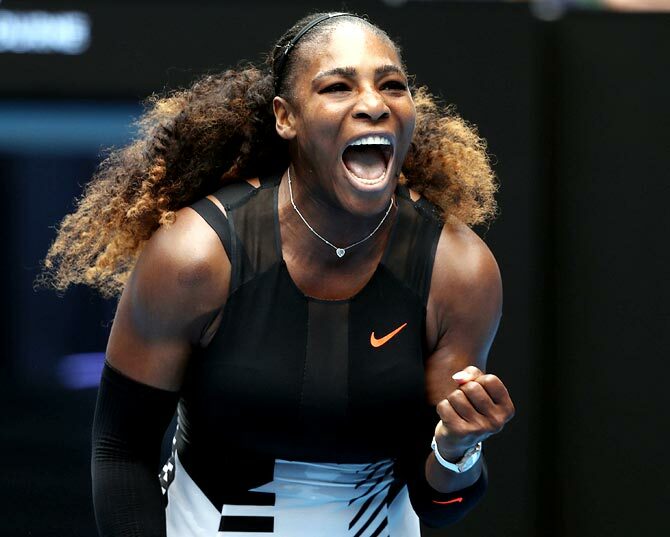 Serena Williams launched her bid for a 23rd Grand Slam title with a 6-4, 6-3 win over Belinda Bencic at the Australian Open on Tuesday, swatting aside doubts over her fitness and motivation on a sweltering day at Melbourne Park. The 35-year-old American came into the tie with two matches under her belt since the US Open last September but moved superbly under a hot sun at Rod Laver Arena to rout the Swiss talent in 79 minutes. Kept honest for most of the first set, Williams ramped up the pressure at 4-4 to win seven straight games before Bencic stalled her victory charge with a late rally. Williams wobbled with a double-fault on match point but smashed a volley on her second to close it out and set up a second round clash against Czech Lucie Safarova. Ivo Karlovic fired down 75 aces in a remarkable Australian Open first-round marathon against Argentina's Horacio Zeballos which lasted five hours 15 minutes and finished with a 6-7(6), 3-6, 7-5, 6-2, 22-20 victory for the Croatian on Tuesday. The tall 20th seed threw his hands in the air in delight after Zeballos ballooned an attempted lob high into the night sky to finally bring an end to the 157-minute fifth set. 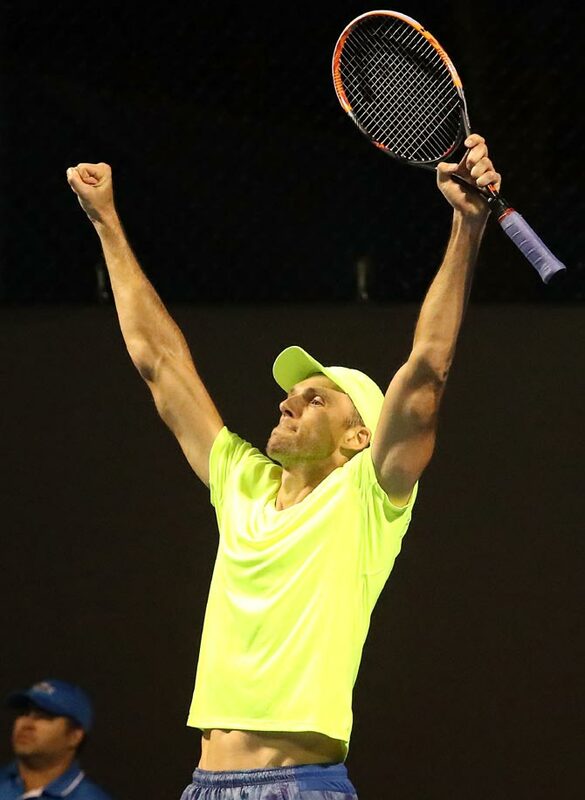 Karlovic embraced his exhausted opponent then exchanged high fives with a large part of the crowd which had stuck with the contest from its start in the afternoon sun to the finish under the low wattage lights on the tiny Court 19. With all the other matches on the outer courts long finished, a carnival atmosphere had developed as the two players tried and failed to break each other's serve in the final set. Organisers sent ballboys running off to get more energy drinks as the marathon continued with the gloom punctuated occasionally by fireworks being set off at a match at the neighbouring Melbourne Cricket Ground (MCG). Karlovic blasted 38 aces in the final set alone, while Zeballos chipped in with 33 in the match and 15 in the last stanza. The break point Karlovic converted was only the fourth in the 42 games in the deciding set, with long rallies at a premium as the serves continued to thwack into the back fence at both ends. Despite its length, the contest was still 38 minutes shy of the record for the longest match at the Australian Open - the 2012 final between Novak Djokovic and Rafa Nadal having gone five hours and 53 minutes. Karlovic will have two days to rest his legs before his second round contest against local wildcard Andrew Whittingham, a serve volleyer who earlier beat Czech Adam Pavlasek 6-4 4-6 6-2 6-3 in a relatively modest 145 minutes. 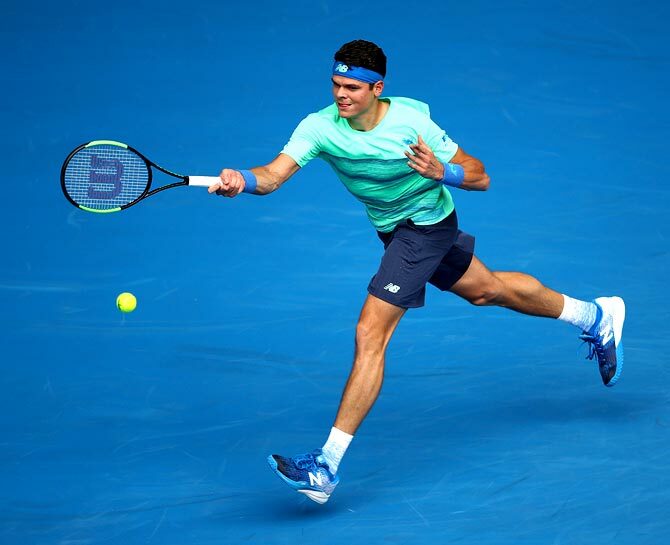 Milos Raonic was not going to be too effusive after his first round victory over Germany's Dustin Brown at the Australian Open because as far as he was concerned he did what he needed to do. The Canadian third seed wasted little time in dispatching the enigmatic dreadlocked German 6-3, 6-4, 6-2 in 93 minutes on Margaret Court Arena, with a powerful service game. Raonic, a semi-finalist at Melbourne Park last year, broke Brown once in each of the first two sets and then twice in the third. He also fired down 18 aces and another 20 unreturned serves. "It was what it needed to be," Raonic matter-of-factly told reporters of his performance. "It's obviously tough to have necessarily a solid performance all the way through, but I did what I needed to. "I took care of my serve. I broke quite early in all the sets. I returned pretty solid when I had to. I stepped up, and I played well." Fifth-seeded Czech Karolina Pliskova, runner-up at the US Open last year, stormed into the second round of the Australian Open on Tuesday with a 6-2, 6-0 thrashing of Sara Sorribes Torm of Spain. Until she reached the final in New York, a run that included victory over Serena Williams in the semi-finals, Pliskova had never gone beyond the third round at any of the Grand Slams. But success breeds confidence and with the first hurdle negotiated, the 24-year-old says she will be able to settle down and focus on her title bid. "If I pass the first round then I feel I can be dangerous for all the players and I can play better and better as it goes on," Pliskova told Reuters in an interview at Melbourne Park. 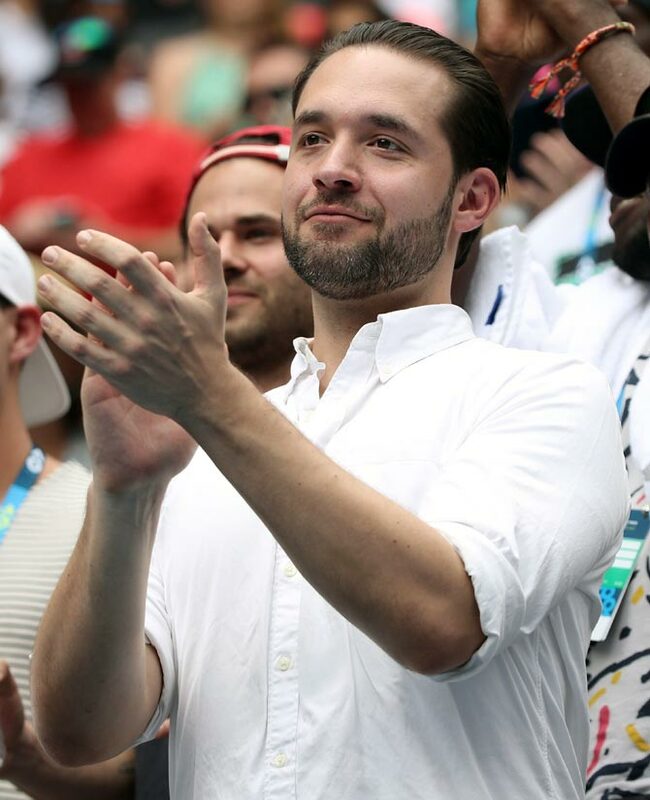 "Reaching the final at the US Open was a huge experience for me. Until then I hadn't passed the third round (of a Slam). "I was waiting for this chance for a long time and I was just happy I could go even further and didn't just finish in the fourth round. "Even when you're not playing your best, somehow you have to win because I know I can be dangerous deep in the tournament, quarters and semis and when there are big players I can beat them." Slovakian sixth seed Dominika Cibulkova eased past Denisa Allertova, who hit 47 unforced errors, beating the Czech 7-5 6-2 to progress to the second round, where she will face Taipei's Hsieh Su-Wei. 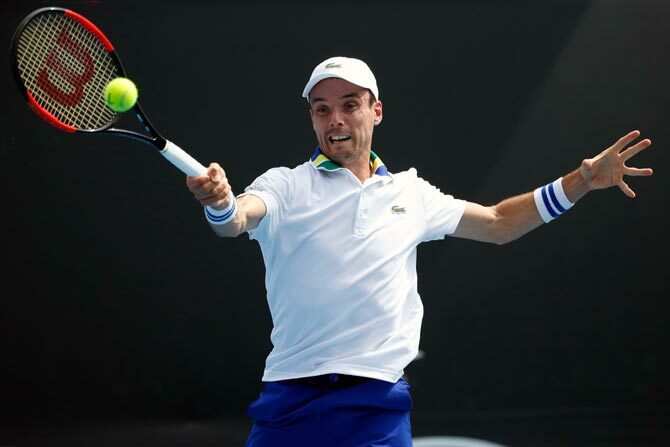 Roberto Bautista Agut made quick work of Guido Pella, with the Spanish 13th seed winning a staggering 97 percent of first serve points to beat the Argentine 6-3, 6-1, 6-1. Agut, who won the Chennai Open earlier this month, plays Japan's Yoshihito Nishioka in the next round. Heather Watson won a two hour, 15 minute-tussle with 18th seed Samantha Stosur, who made 47 unforced errors, 6-3, 3-6, 6-0. The young Brit forced Stosur into long rallies and took advantage of the Australian's wayward ground shots.